Since 1901, 129 people have been honored with the Nobel Peace Prize, an honor awarded to people who have "done the most or the best work for fraternity between nations, the abolition or reduction of standing armies and for the holding and promotion of peace congresses," according to Alfred Nobel's concept. The ​​Nobel Peace Prize is intended to give attention, encouragement, and much-needed funding to people and organizations who are trying to bring peace on Earth. to help them expand their work and have more success. Although there are about ​100 other peace prizes awarded throughout the world, the Nobel prize is one of the most famous. The winner of the Nobel Peace Prize receives a medal, the title of Nobel Peace Prize Laureate, a personal diploma, and 10 million Swedish crowns (more than $1.4 million US dollars). Popular Nobel Peace Prize winners include Mother Theresa, Martin Luther King, Jr., Nelson Mandela, and Malala Yousafzai. But who gets to decide which people have made the greatest steps toward peace in any given year? Who Chooses the Nobel Peace Prize Winners? The Nobel Peace Prize winner is chosen by the Norwegian Nobel Committee, which is made up of five members appointed by the Norwegian parliament. These members are supposed to be fiercely independent. For example, since 1936, government officials have been prohibited from sitting on the committee to avoid any hints that the Committee may be influenced by the current political climate in Norway. How Do You Get Nominated to Be a Nobel Peace Prize Winner? You can't nominate yourself or others for the prize, and you can't campaign to be chosen the winner. In fact, you won't even know if you've been nominated—according to an article in The Associated Press, "Common Misconceptions about the Nobel Peace Prize," records of nominees are kept secret for up to 50 years. 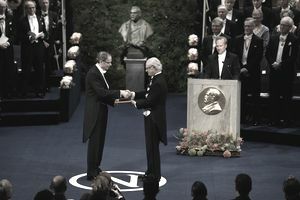 According to the Nobel Peace Prize website, nominees are only accepted from a select few people, including members of national governments, members of the Permanent Court of Arbitration and of the International Court of Justice at the Hague, former Nobel Peace Prize winners, university professors in certain fields, and so on. Organizations can be nominated as well as individuals. How Are Nobel Peace Prize Winners Chosen? The goal of the Nobel Peace Prize is to reward people who have made major steps toward bringing peace to the world in the year before the nomination. Oftentimes, the Nobel Peace Prize winners are people who have not completed their work toward peace, but who are at a critical juncture in their work and who need the support that winning brings. To pick the winners, the Norwegian Nobel Committee considers all nominees, then selects a "short list" of five to 20 people for further review. Those candidates are then considered for the prize. The Committee's permanent advisors and other experts gather information about the short-listed candidates into reports which help the committee with their deliberations. The Committee attempts to reach a unanimous vote through discussions and debates. If a unanimous decision can't be reached by the deadline at the beginning of October, a majority vote will suffice to name the Nobel Peace Prize winner.